Dr. Renu, completed her MBBS from MSR Medical College, Bangalore, India and her MD in Microbiology from Armed Forces Medical College, Pune, India. Dr. Renu is also certified as ‘Six-Sigma – Green belt’ by British Standards Institute (BSI). She is a certified professional in hospital infection control and certified as hospital surveyor by AHIQ, USA. She started her career in 2000 as Manager Quality Assurance for Reference Laboratory in Dr. Lal Path Labs Pvt. Ltd and was later promoted as Head – Department of Microbiology in 2003. She developed various quality control systems as per NABL/ISO/CAP/CBAHI requirements. 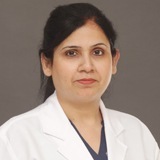 Dr. Renu has worked on Polymerase chain reaction for diagnosis of M. tuberculosis, Hepatitis B & hepatitis C virus, Herpes simplex virus & branched DNA Technology for HBV & HCV. In addition, she has worked on Liquid hybridization by ELISA for detection of PCR amplified products. Before joining NMC Healthcare she was employed with Ministry of Health, Saudi Arabia as a Specialist Microbiologist, Quality Advisor & Head Statistics in the Reference Laboratory, Eastern Province. The laboratory is currently performing 1,000,000 specialized tests annually in the fields of Clinical biochemistry, Blood bank, Immunology, Molecular Biology, Flow Cytometry, HLA, Hematology, Virology, Blood Bank, Microbiology, Histopathology & Cytogenetics. Her core competencies include administration and management of a clinical laboratory with a strong emphasis on quality control and quality assurance. She possesses in-depth knowledge of standards and accreditation process by various bodies such as NABL (India), ISO 15189 (India), CAP (USA) and CBAHI (Saudi Arabia). She has written two publications on Meningococcal Infections: D.M.A and Antibiotic associated diarrhea: Insight - LPL Newsletter Awards. She has also received the best paper presentation award for her presentation on ‘Comparison of conventional & newer molecular methods for diagnosis of pulmonary and extra-pulmonary tuberculosis’. Dr. Renu can speak English and Hindi.